It’s no secret that I love crocheting baby blankets, or that I find crocheting granny squares soothing, or that I love bright colors. So, it should be no surprise that I had a wonderful time making this motif baby blanket in vibrant colors! This post contains affiliate links. I may receive compensation (at no added cost to you) if you make a purchase using these links. Yarn for the sample was generously provided by Darice/Consumer Crafts. For this pattern, I picked two, bold solids in All Things You Bulky and a coordinating, variegated yarn. The vibrant colors make a statement wherever you place this blanket! The motifs worked up quickly in the bulky yarn, and I used a slip stitch seam to join the squares together. I prefer the slip stitch seam for baby blankets because it’s very durable and holds up to a lot of washing, but it doesn’t add too much bulk on the wrong (back) side. Originally, I planned to add a border, but once I put together the blanket, I thought it looked complete without it. The blanket is plush and cuddly so it can also be used as a baby floor mat. If you make your own Sweet Treat Baby Blanket, I’d love to see it! Share your progress and questions by tagging me on Facebook as @Underground Crafter, Instragram as @ucrafter, or Twitter as @ucrafter. Sign up for my weekly newsletter and get a coupon code for your choice of one of my premium patterns and other subscriber goodies. Plus, you’ll never miss one of my free patterns again! Add the Sweet Treat Baby Blanket to your Ravelry favorites or queue. 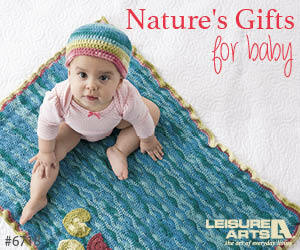 Textured blocks and bulky yarn combine to create a cuddly blanket that doubles as a baby floor mat. Baby Blanket: 32” (81.5 cm) square. Darice All Things You Bulky yarn (100% acrylic, 3.5 oz/100 g/109 yd/100 m) – 4 skeins ea in 30019740 Fuchsia (CA) and 30019743 Yellow (CB) and 3 skeins in 30019747 Passion (CC), or approximately 390 yd (356.5 m) ea in CA and CB and 260 yd (238 m) in CC in any bulky weight yarn. US Size L-11/8 mm crochet hook, or size needed to obtain gauge. 1 Square = 8” (20.5 cm) in pattern. Exact gauge is not critical for this project. FPtr – front post treble (triple crochet) – Yo twice, insert hook from front around back to front of st in previous row, yo and draw up a loop, (yo and draw through 2 loops) 3 times. Ch 4, skip 3 ch, join with sl st to next ch to form ring. Fasten off with long yarn tail (approximately 36”/91.5 cm) for seaming. Following placement diagram, join squares together to form rows and then join rows together. With yarn needle, weave in ends on wrong side of blanket. © 2017 by Marie Segares (Underground Crafter). This pattern is for personal use only. You may use the pattern to make unlimited items for yourself, for charity, or to give as gifts. You may sell items you personally make by hand from this pattern. Do not violate Marie’s copyright by distributing this pattern or the photos in any form, including but not limited to scanning, photocopying, emailing, or posting on a website or internet discussion group. If you want to share the pattern, point your friends to this link: http://undergroundcrafter.com/blog/2017/04/17/crochet-sweet-treat-baby-blanket/. Thanks for supporting indie designers! Such a refreshing change of pace . . . beautiful design. Also love your color choices. It looks so soft and squishy! Beautiful work.